The Fixed-Site and Mobile PIWS-3000 System is a throughput process that feeds the medical waste into the system on a continuous basis. Once the waste enters the grinding chambers, the pre-measured Cold-Ster is added automatically. A mist of water is also added to activate the process. The waste is pushed through the grinding process until small enough to pass from the top chamber to the bottom. In the bottom chamber the waste is continually ground until the waste is small enough to be forced through the out-auger. After the waste has been thoroughly mixed and processed, the waste is pushed out through the out-auger and discharged over a pH probe located at the end of the discharge tube. The PIWS-3000 technology is built around its proprietary, patented grinding action. This technology was first introduced in 1994 and Positive Impact Waste Solutions has continually upgraded and enhanced the process. In 2001, PIWS received a new U.S. patent on the grinding technology based on these enhancements and has since received patents in China, Russia, the United Kingdom, Mexico, Korea, Canada, Germany, Turkey, France, Italy, Spain, Ireland and PIWS has filed for international patent rights in several other significant countries. The grinding action of the PIWS-3000 was built from the ground up to handle only regulated medical waste. This grinding action and PIWS’ EPA-approved dry chemical (Cold-Ster®) combine to provide the “Next Generation” technology for the regulated medical waste industry. For a demonstration the system operates, please play the animated video below. PIWS’s patented PIWS-3000 mobile/on-site medical waste processing unit will process at a medical facility or at a permitted fixed site. For a mobile unit, PIWS personnel will take the facilities waste from the facility’s holding area to the processing staging area. 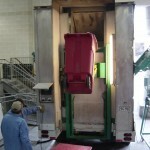 For a on-site unit, the medical facilities personnel will load the unit as the waste is received. 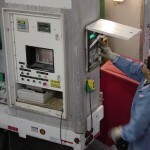 Once the unit is prepared for processing, the medical waste stored in the containers is transferred to the on-board feed hopper. Only the medical waste produced by the facility is actually weighed in the hopper. The PIWS-3000 has an on-board computer interface that monitors the entire process. After the operator stages and loads the waste directly into the feed hopper, the net weight of the load is measured. The automated cart lift mechanism transfers the waste into treatment chamber, where the registered dry chemical, Cold-Ster®, is chemically bound to the waste material. The proper amount of Cold-SterÂ® and water mist required to treat the volume of waste to be processed is added based on the weight of the waste to be processed. The RMW is ground and mixed completely. This process balances the pH level and renders the organic material and microbiological organisms non-infectious. In addition, the processing teeth of the PIWS-3000 grind the waste enough times to reduce the original volume by more than 70% and renders the waste unrecognizable. The pH level is continuously monitored for compliance with approved guidelines as the treated waste leaves the exit auger. The pH monitor is attached to the base of the out-auger, with a direct connection to the on-board computer. The treated material is then emptied into the medical facility’s general waste stream. The PIWS-3000’s on-board computer captures all required information for permanent and regulatory records. All of the information captured during the treatment process described above is captured on the PIWS-3000’s on-board computer. This includes the medical facility’s identification name, address and location and the date of processing. For each load, the exact time, weight and ending pH is captured by the computer. This information is printed on a manifest on the on-board printer. After all of the waste is processed, the printed manifest is available for facility personnel.